Jake Elliott was a stud in 2017. Now that the Philadelphia Eagles' offseason is (finally) underway, let's take a look at each position and figure out which players will be back in 2018, and which ones will be playing elsewhere. Here we'll look at the specialists. Elliott missed a few easy kicks, including a handful of PATs, but he was 12/13 from 40-49, and 5/6 from beyond 50. He also drilled every clutch kick he took in 2017, including obviously his 61-yarder to beat the Giants, and a 46-yard "ice water in the veins" kick with 1:05 to play in the Super Bowl. #JimmyVerdict: He'll likely kick unopposed in training camp. Jake Elliott: Stay or Go? In any other year, I'd say it's a no-brainer that Donnie would be back, but he's going to count for $1,875,000 against the salary cap in 2018. For a salary cap-challenged team, I wonder if the Eagles would consider cutting him prior to the start of the new league year to make way for Cameron Johnston, a lesser punter, but a cheaper one who would carry a cap number of $480,000. #JimmyVerdict: I just can't predict Donnie to go. Donnie Jones: Stay or Go? There was mass panic (OK, maybe not) when the Eagles traded Jon Dorenbos to the Saints, as many wondered how in the world could they go in another direction. And then... we never heard Rick Lovato's name for the rest of the season, which is a good thing for a long snapper. #JimmyVerdict: Lovato will be back. Rick Lovato: Stay or Go? Sturgis was placed on IR with a quad injury suffered Week 1 against the Redskins, and he was replaced by Elliott, who took a stranglehold of the kicking job. Sturgis will be free to leave in free agency, and the Eagles will hope he gets a big enough contract to qualify for a compensatory pick. 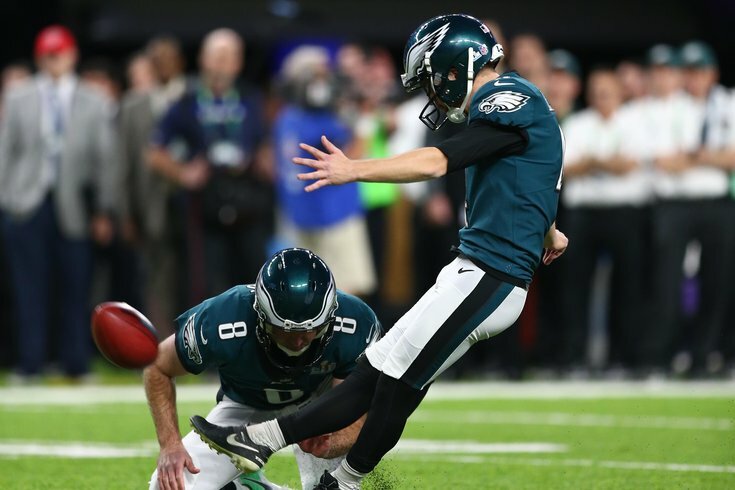 Caleb Sturgis: Stay or Go? The Eagles needed some special teams help late in the season, so they turned to a familiar face in Braman. He was almost certainly just a short-term rental who got a ring for his troubles. Bryan Braman: Stay or Go?